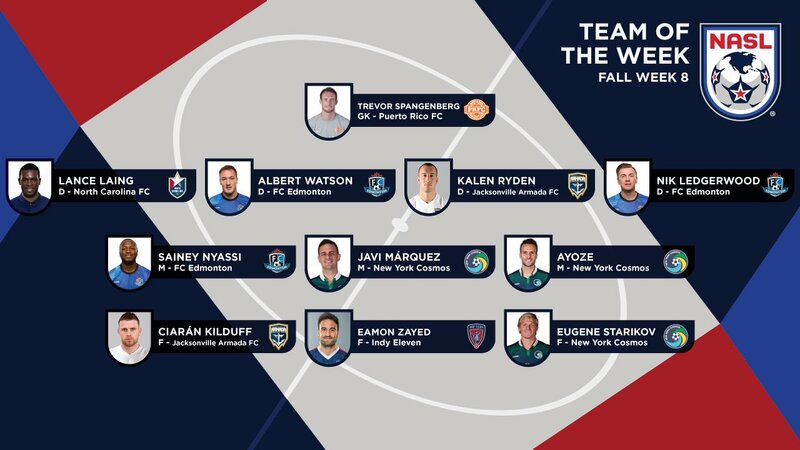 Ciaran Kilduff has been named on the NASL team of the week for the second time since his move Stateside from Dundalk to Jacksonville Armada FC. 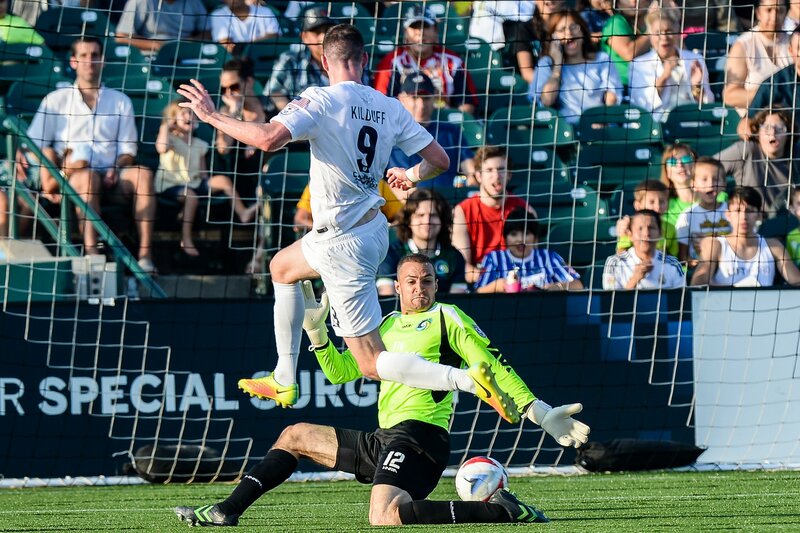 Kilduff was a shoe in for one of the positions upfront following his brace away to New York Cosmos last Sunday night. He has been named alongside another former League of Ireland player Eamon Zayed. The pair once played together at Shamrock Rovers. The Armada’s new number 9, Kilduff, gave his side the lead in The Big Apple after just 13 minutes before doubling their lead just before half time. He was also joined on the team by his team mate Kalen Ryden at centre half. The Cosmos did put some dampner on the night for the big Kilcock man, fighting back from 3-0 down to snach a draw (3-3) in added time. 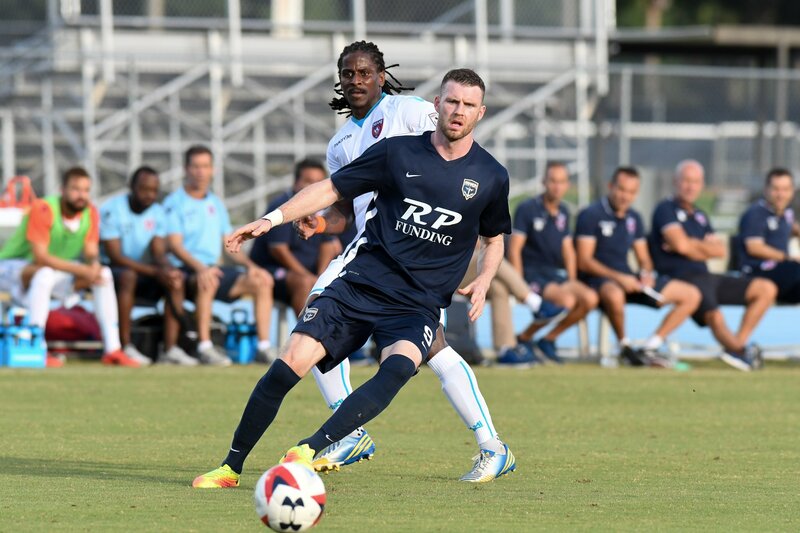 Ciaran Kilduff was introduced to the home crowd sooner than he thought as Jacksonville Armada brought him on 30 minutes into their 1-0 loss against Miami FC at The Hodges Stadium on Sunday night. Kilduff replaced the injured Tony Taylor in what turned out to be tough debut against the NASL Spring Season Champions. 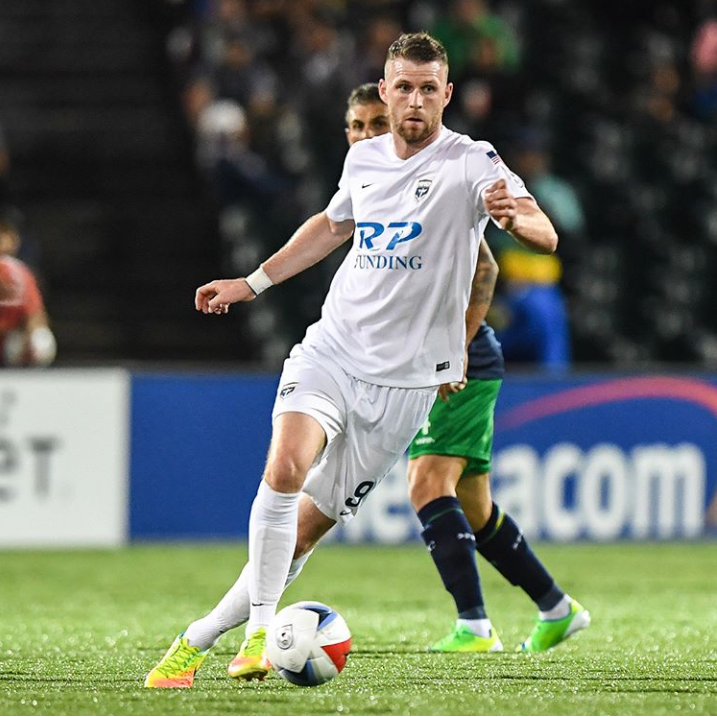 Despite his sides extensive efforts including thirteen shots with four on goal, the Armada FC lost out and remain bottom of the table. Although they were unable to collect any points on Kilduff’s debut, head coach Mark Lowry remains positive. In the middle of the first half, Ciarán Kilduff made his first appearance for the Armada FC– just two days after arriving in Jacksonville. Tony Taylor went to the ground with an injury and Kilduff replaced him in the 30th minute. Kilduff had a chance after his new team mate Rebellón dribbled the ball past multiple defenders before cutting the ball to the Kilcock man whose shot went just left of the goal. Despite the best efforts of Kilduff and Armada FC, Jacksonville could not find the net to equalize the, meaning Miami FC took all three points at Hodges Stadium. Next the Armada FC will hit the road, as they travel to face Indy Eleven. Kickoff is at 7:30 p.m. Saturday in Indianapolis. The team will return home on Saturday, Sept. 9 for First Responders Night at Hodges Stadium. Dundalk FC striker Ciaran Kilduff has left the defending League of Ireland champions to move to American NASL side the Jacksonville Armada FC. Kilduff, who scored 31 goals in 82 appearances for the lilywhites, including the match winner against Maccabi Tel-Aviv in the Europa League group stages, the first ever win for an Irish side in European competition, leaves Dundalk on good terms and reflects on his two years at club as the best of his career. “It has been the best two years of my football career,” Kilduff told Dundalk’s official club website. “There’s no other way to describe it. It has been the best dressing room, the best staff, best management team that I have been involved with. I have had some really great moments personally, individually and collectively as a team with the club. “I have had some bad moments as well with some injuries too. It was eventful along the way. “I am just really happy to have been a part of something which has been so great. There was so many great nights and moments for us. To be part of it is something that I will always be proud of. 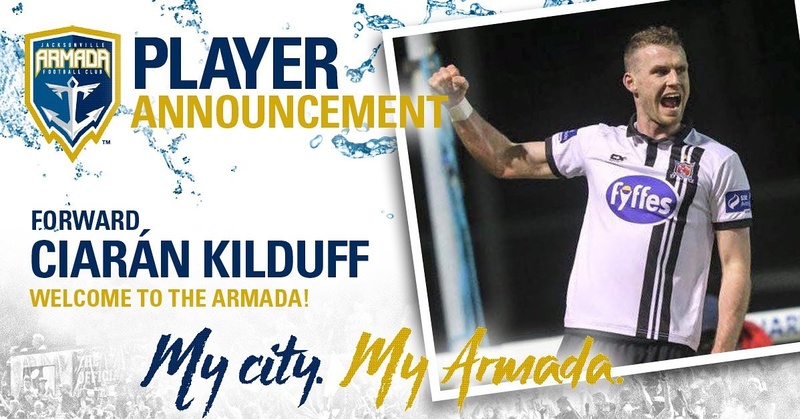 Kilduff said that his move to the Armada was a ‘now or never’ opportunity for him and his family, and that he’ll be looking to try and emulate former Shamrock Rovers teammate Richie Ryan’s move from the Hoops to the NASL. “For me, I will always look back at this as the greatest two years in Ireland,” added Kilduff. “This is something which is completely out of left field. It is something which has interested me in maybe the last year or so if the opportunity came. I have a young family so the timing seems right for me. “When my daughter gets a little older and gets to school going age things will have to change so I felt that this was a ‘now or never’ situation for me. Football in America is taking off. I am going over there to grasp it and try to further myself. “I see players like Richie Ryan and players like that who have bettered themselves and furthered their careers. “There is so much over there, so much room for progression over there. It’s not something I have taken lightly at all.